Long-awaited movie to make its US debut at this year’s SXSW. 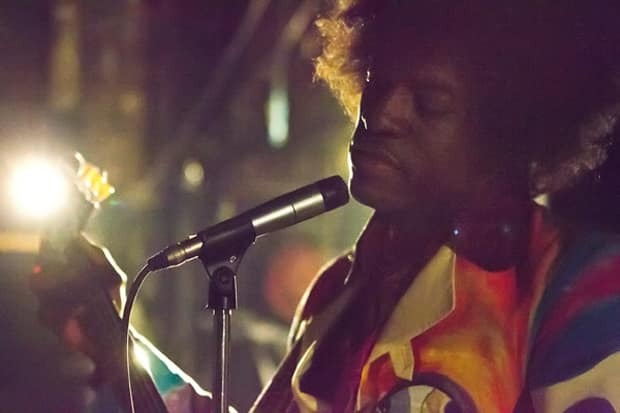 All Is By My Side, the Jimi Hendrix biopic starring André 3000 and directed by John Ridley, will make its US debut at the film portion of this year's SXSW, Billboard reports. First shown last fall at the Toronto International Film Festival, the movie follows Hendrix in the UK during two years preceding his major fame, 1966 and 1967. It will be released around Europe and Russia this Summer; no US theatrical release has been announced. André 3000 was cast as Hendrix in 2012, and filmed the movie that year in Ireland. Early reviews of his performance have been mixed: The Guardian called his performance an "impeccable impression," whereas NPR said he was "comfortable enough" in the role. Barred by his estate, Hendrix songs do not appear in the film; a crew of star session musicians were brought on to replicate the originals.